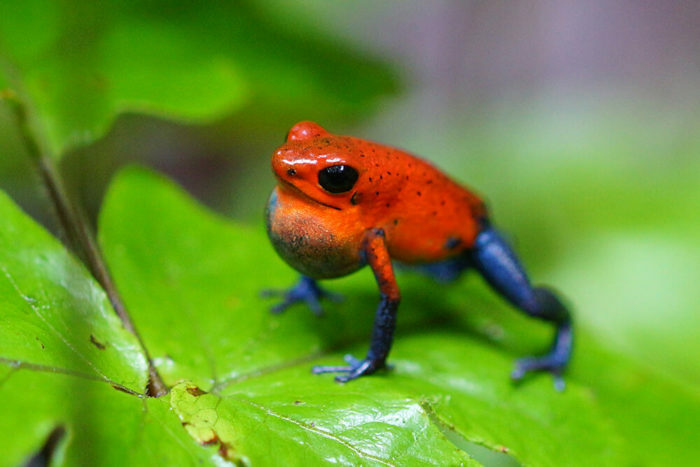 Arguably, the most brightly colored frogs in the world are poison dart frogs (also known as poison arrow frogs or dendrobatids). These frogs live in wet tropical forests in Central and South America where their diet contributes to the toxins they secrete through their skin. Poison frogs are commonly called poison arrow and poison dart frogs due to native Indian tribes reportedly rubbing their arrow tips on the frogs’ backs before hunting. However, only three species have been documented as actually being used for this purpose, including the golden poison frog, the most toxic of all frog species. 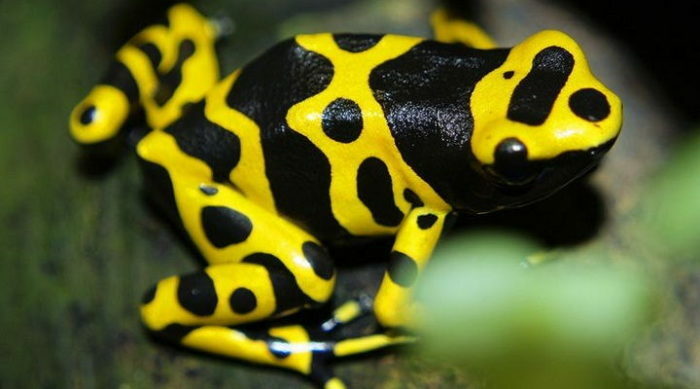 Dendrobatids are commonly known as poison arrow and poison dart frogs due to native Indian tribes reportedly rubbing their arrow tips on the frogs’ backs before hunting. 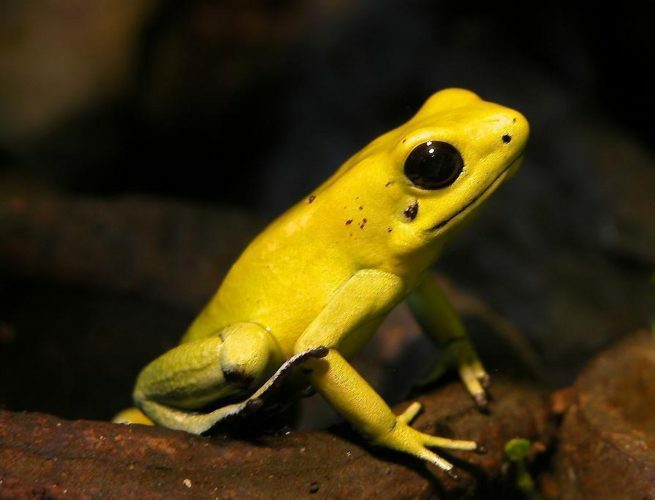 However, only three species have been documented as actually being used for this purpose, including the golden dart frog (Phyllobates terribilis), the most toxic of all frog species. Much medical research is now being done with the alkaloid toxin, batrachotoxin, that the P. terribilis secretes. Researchers are trying to develop muscle relaxants, heart stimulants and anesthetics from the batrachotoxin. This toxin is 200 times more potent than morphine. Poison frogs are known for their beautiful colors, and amphibians that have toxic skin secretions tend to have bright warning colors or patterns. It is theorized that these colors function as a visual warning, a learned response on the part of the predator. A predator that finds a certain kind of amphibian to be distasteful will associate the warning color with the bad taste and after one or more such experiences, will recognize the distasteful species and refrain from attacking. Aposematic coloration usually involves red, orange or yellow. Some animals have bright coloration that does not correlate to toxicity, presumably mimicking those animals in which color truly is a warning. Funny enough though, the toxic only affects the victim if it is injected into the blood stream. Licking one of these frogs does nothing at all, sans tasting terrible. Poison frogs can be heard calling in the flooded forests. Most species of frogs have well-developed vocal structures capable of producing a variety of sounds that serve to attract mates, advertise territories or express distress. Sound production is often the most common form of communication in animals that jump or fly because they would otherwise have a difficult time communicating by scent. Frogs produce sounds using their laryngeal apparatuses (larynx/vocal chords) and most males have vocal sacs that function as resonating chambers. Species of frogs can be identified based on their calls. Poison frogs feed mostly on small insects such as ants, termites, and toxic mites, which they find on the forest floor. Many species capture their prey by using their sticky, retractable tongues. 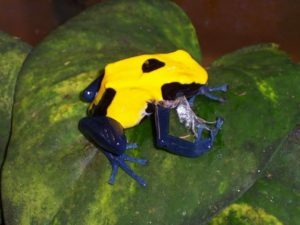 Scientists believe that poison frogs gain (or synthesize) their poison from a specific arthropod and other insects that they eat in the wild and that these insects most likely acquire the poison from their plant diet. 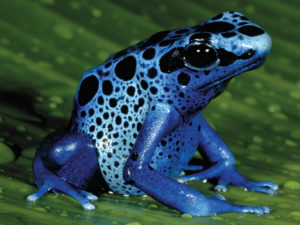 As a result, poison frogs in captivity, on a diet of crickets and other non-poisonous insects are not poisonous. Did you know that most species have omnivorous tadpoles that will eat all sorts of food from algae and detritus to insect larvae and dead insects? 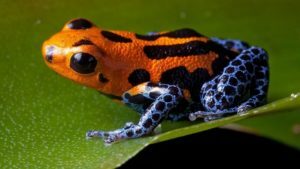 Some species tend to be more carnivorous (such as the tri-colored poison frog) and eat insect larvae and other tadpoles. Females of some poison frog species place individual tadpoles in water in bromeliads and then periodically return to the site of each tadpole and deposit unfertilized eggs, which the tadpoles eat. Nearly all dart frogs are diurnal. Poison frogs in general can live for over 10-15 years in captivity. Although, they tend to live shorter lives in the wild.